Today marks the centenary of the birth of George Barker, one of the 20th century’s most Bohemian and charismatic of British poets. Though championed by T. S. Eliot, and loved by women - he had 15 children with four different partners - he is less well remembered than his contemporary, the similarly roguish Dylan Thomas. Scant evidence exists of Barker having been a diarist, though, Robert Fraser, uses a few diary notes in his 2002 biography, The Chameleon Poet. More interesting are the many references to Barker in the diaries of Elizabeth Smart, who wooed him, won him occasionally, had four children with him, but spent most of her life resenting his absence. Barker was born in Loughton, Essex, on 26 February 1913, and raised by his Irish mother and English father in Battersea, London. Having left school at an early age, he soon found he wanted to pursue a career in writing. Encouraged by an elder sister, he sent the text of a recent journal to John Middleton Murry, editor of The Adelphi, who then gave him reviewing work and an introduction to other literary figures of the time. Aged just 20, Barker published his first book of poetry - Thirty Preliminary Poems - with Parton Press. The same year, he married his childhood sweetheart Jessica Woodward, and they moved to a cottage in Worth Matravers, Dorset. They would have three children together. Barker soon came to the attention of T. S. Eliot at the publishers Faber and Faber, who supported him with advice and money, and published his next collections of poetry, Poems (1935) and Calamiterror (1937). Eliiot also helped him to get a position in Japan, in 1939, as Professor of English Literature at Tohoku University. But he hated the job, even his inaugural lecture went wrong, when his notes ran out with an hour still to go (see diary entry below). He then travelled to the United States, where he began a liaison with a Canadian writer, Elizabeth Smart, who had been pursuing him for a while. In 1943, Barker returned to England, leaving his wife and her children in New York, and joined Smart who had relocated to the Cotswolds. In 1945, Smart published her now famous autobiographical novel - By Grand Central Station I Sat Down and Wept - about her affair with Barker. In 1950, Barker responded with The Dead Seagull, describing his view of the affair. By the 1950s, Barker was living in London with the film-maker Betty Cass, and spending some weekends with Smart, though Smart, in fact, spent much of her life filled with resentment towards Barker. By the end of the decade, Barker was living in Rome with yet another woman, Dede Farrelly, who would bear him children (three sons). In 1963, he met the young Scottish writer Elizabeth Langlands with whom he lived in Norfolk, and with whom he had five more children. He continued to produce books of poetry every few years, and to teach occasional semesters in the US. His Collected Poems were edited by Robert Fraser and published in 1987 by Faber and Faber. He died in 1991. Further information is available from Wikipedia, London Grip, The Guardian and Richard Warren’s blog. Also worth reading is Christopher Barker’s article in The Observer about his parents. 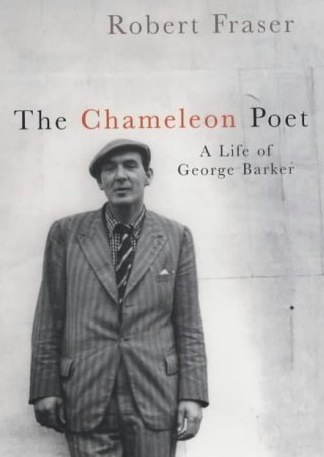 Barker does not seem to have left behind a diary of any significance, but there are a few mentions, and even an occasional quote, from Barker’s ‘journal’ or ‘diary’ in Fraser’s biography, The Chameleon Poet, published by Jonathan Cape in 2002. Unfortunately, Fraser does not provide any source for Barker’s diary, and the references to it peter out in the early 1940s. The University of Victoria library, in British Columbia, Canada, which has a significant archive of Barker’s literary remains, lists a ‘Manuscript Diary for 1968’: ‘Not a busy year, with probably less than 1,000 words of entries. Covers somewhat stained, as usual with Barker’s books.’ Otherwise, Fraser’s biography relies heavily on Barker’s letters, and, to a lesser extent, on the published diaries of Elizabeth Smart: Necessary Secrets (Grafton, 1991) and On the Side of the Angels (HarperCollins, 1994). For more on Smart’s diaries see The Diary Junction; her own centenary will be later this year, on 27 December. Here are two extracts from Barker’s diary as found in The Chameleon Poet, the first about his inaugural lecture in Japan, and the second about Elizabeth Smart. They are followed by several about Barker from Smart’s published diaries.